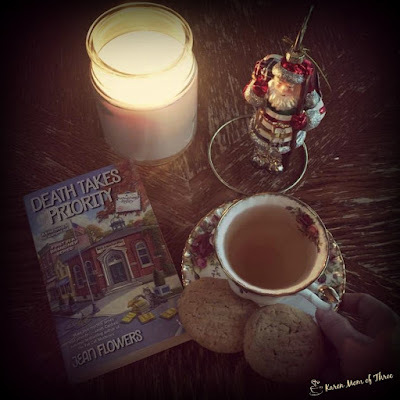 Three Holiday Booked Themed Delights! 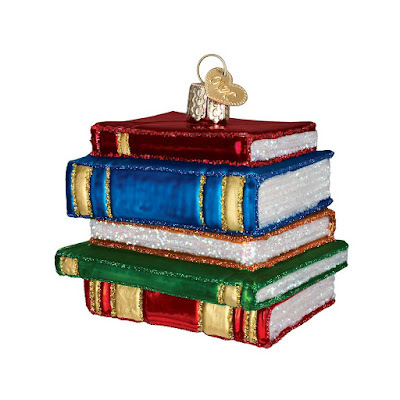 I got an email from Amazon that the book ornament I loved is on sale! I love this as my mother in law started me on these type of ornaments 15 years ago, I may have to order this one for myself. Click here to see this one for yourself. 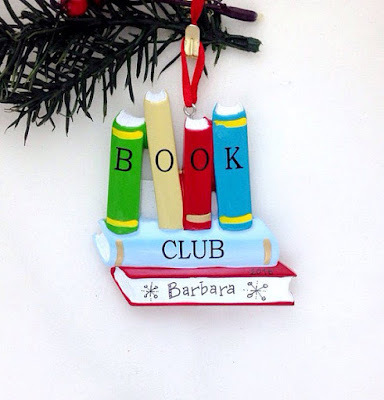 I also loved this fun one from Etsy, I wish I had a book club! Click here for this listing on Etsy. 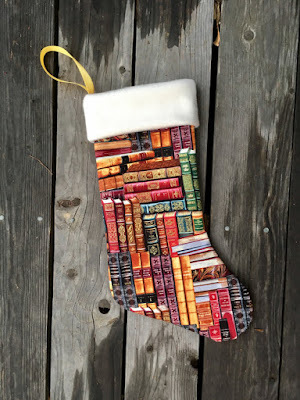 Not an ornament but something I love is this Book Stocking I found on Etsy by Brightspotdecor. 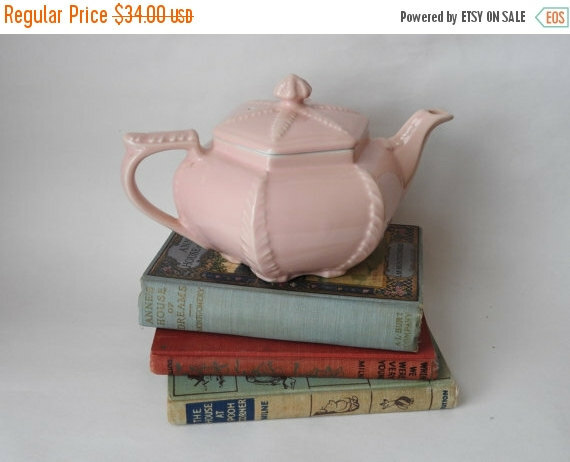 Click here for shop and this listing! I would love a wall of these! 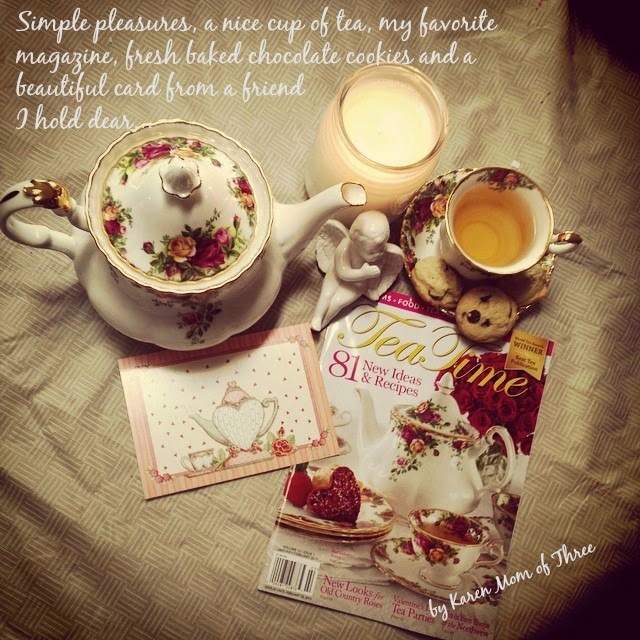 Thank you for joining me for a cup of tea and a cozy holiday themed post. 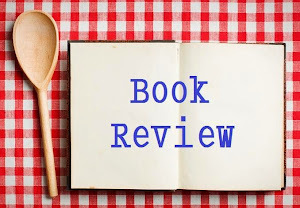 I promise to get more reading in today back with more reviews for you very soon! I should be reading, however the crafting bug bit me and together yet completely apart my dear friend Sheryl from Booth Talks Books and I set out for an impromptu craft evening, miles and miles apart! 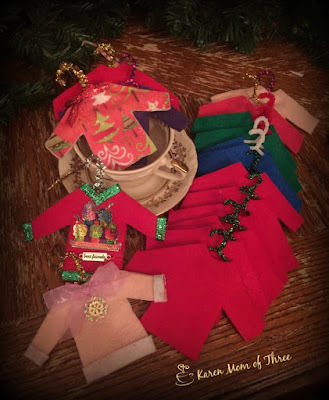 Just after dinner time something caught my eye on Facebook and I knew it was right up our alley so I shared it with Sheryl and we both decided to drop everything and make these adorable little ornaments. 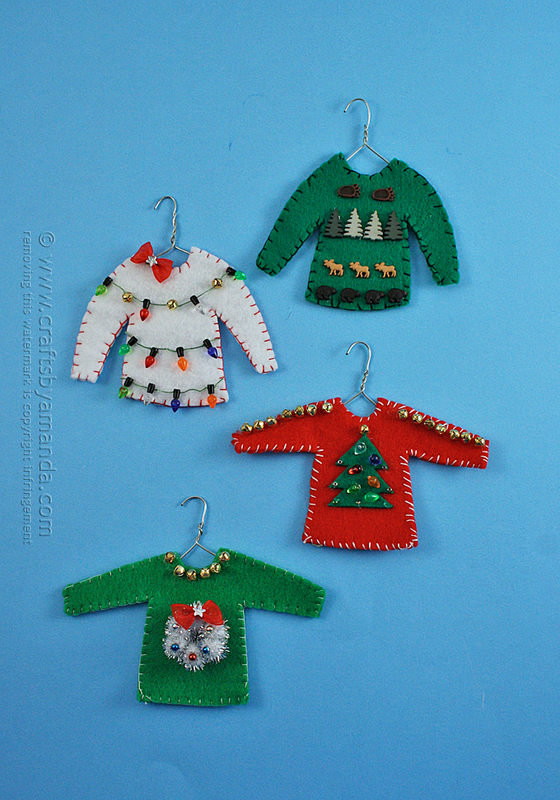 My post today is inspired by craftsbyamanda.com who posted her tutorial of some adorable ugly sweaters! 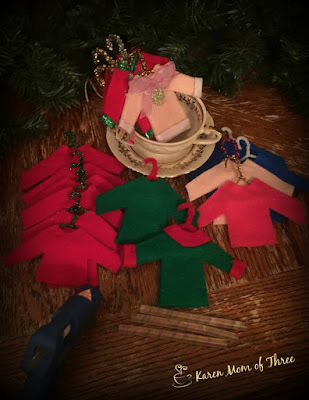 I however am an impatient crafter so I changed the sewing step to hot glue.....(Click here to see Crafts By Amanda's tutorial and for a pattern). I don't have a printer at home so I free hand drew a sweater shape, cut out my own pattern and set to work! My cozy table quickly became a tiny elf sweater assembly shop! 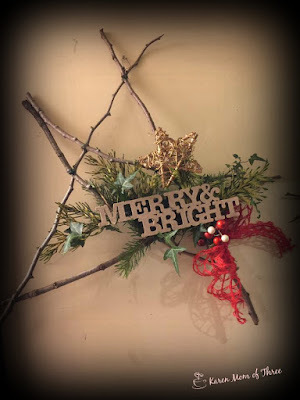 I actually ran out of felt, pipe cleaners and trim before the night was out and contemplated taking a run to Michael's the craft store but I had already changed into my at home clothes and glasses, so later today I will pop out for some embellishment fun! 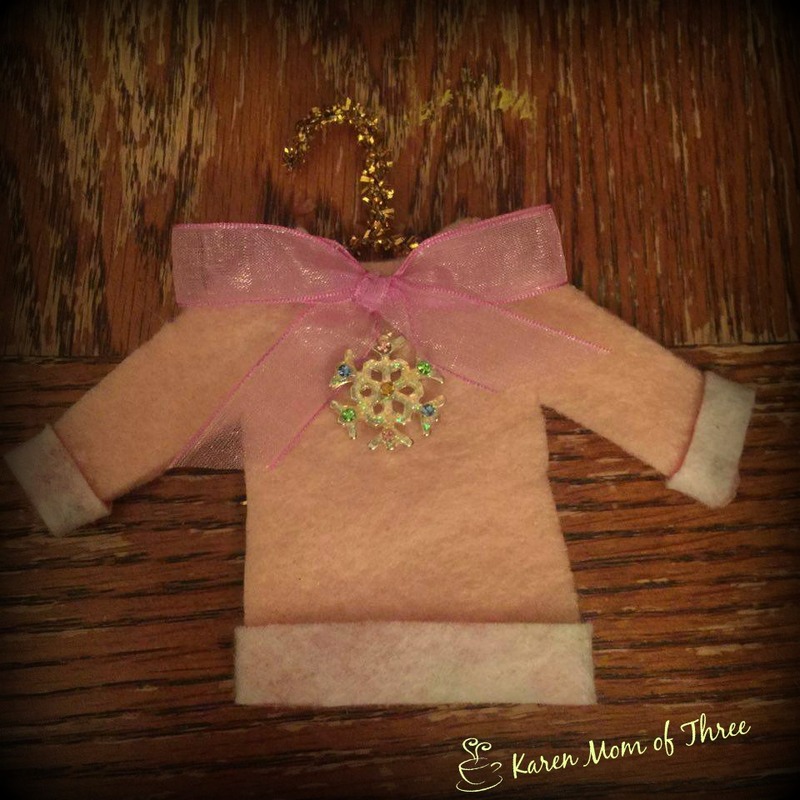 I will hope to finish these tiny sweater ornaments for my 7 nieces and nephew later today so I can get back to reading. 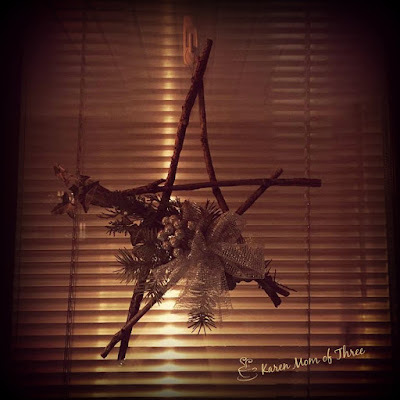 I hope you are inspired to use what you have to create something fun this holiday season! Yesterday I finished the Ghosts of Misty Hollow by Sue Ann Jaffarian. 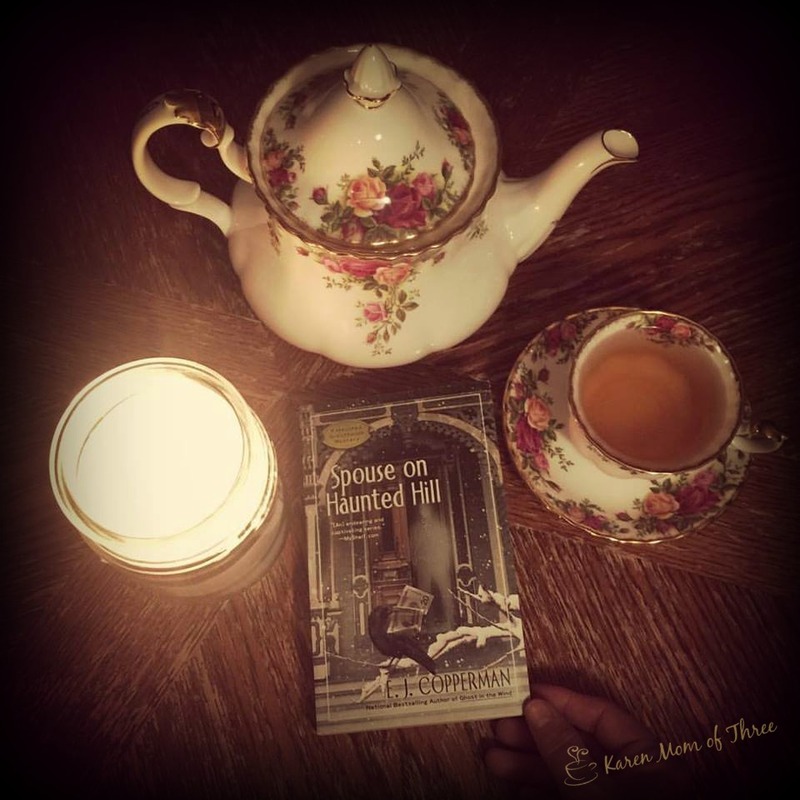 Let me first start by saying I have never read any of the Ghost of Granny Apples Mystery Series, boy have I been missing out! What an amazing and fun series this is. Out December 6th this book is one not to miss! A picturesque spot to collaborate on a book with a famous writer, a 100 year old mystery to solve in the paranormal realm and a not so tidy recent murder on the grounds, a small town librarian with a great back story and important role in the book...this book had everything wrapped up in a pretty bow! 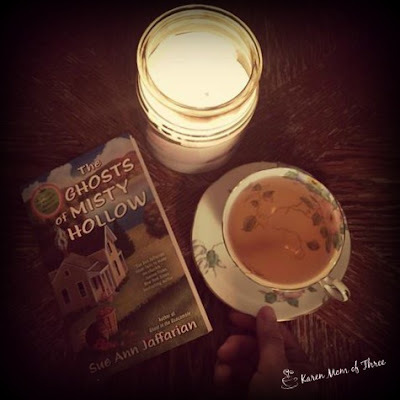 Perfect ghostly feel good story. To learn more about this series by Sue Ann Jaffarian please click here. To order your own copy of The Ghosts of Misty Hollow from Amazon, please click here. There is something to be said about taking back the holidays, I have struggled in the last 6 years to regain the joy of the holidays since my mom passed away. Finding that new normal and making the most of it is a work in progress. Life is crazy, the holiday hype makes Christmas time even crazier, that vortex of holiday crazy seems to start earlier every year. I know it is November but with less then a month to Christmas Day, I am thrilled that my friends kindly humor me and come to my annual cookie exchange before everyone is booked through the new year. I have lost track of how many years I have hosted a cookie exchange party and though it is always a ton of work it is always a great way to start and enjoy the holiday season! Last night some of the most wonderful people in the world baked 15-16 dozen cookies and brought them here to swap with others. 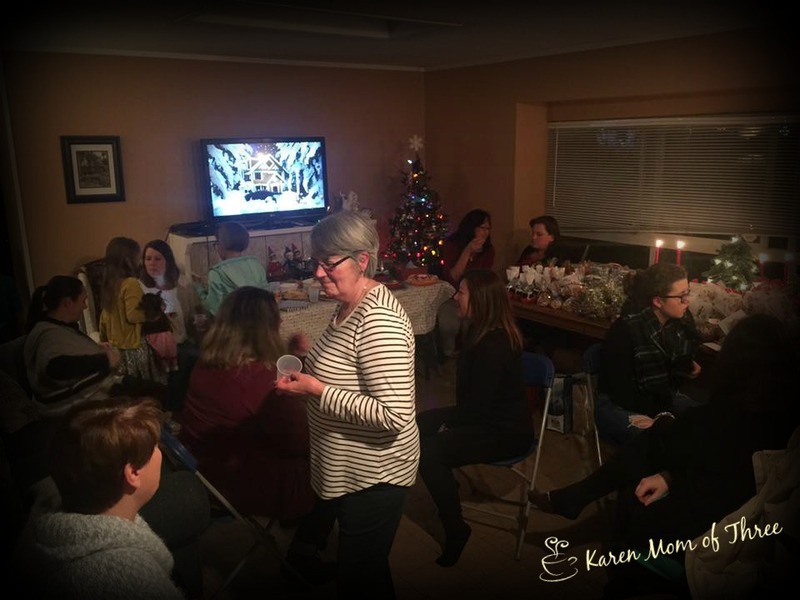 The result is a home bursting at the seams, children, cookies and joyful noises fueled by friendship, appetizers and of course cookies! 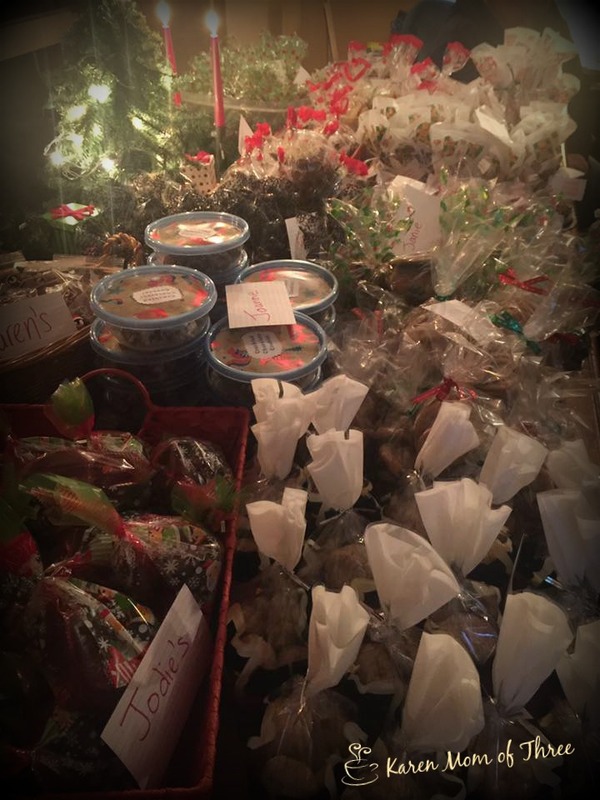 The table filled up quickly and everyone took home an amazing assortment of cookies. 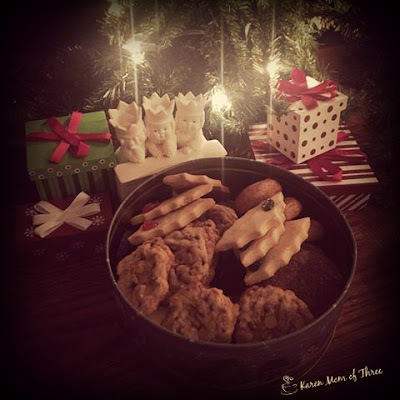 If you have never done one of these types of cookie swaps before I really encourage you to try them, it is so much fun and really when I started we all baked a double batch of cookies and swapped, now the party has grown and each year we seem to bake more! I really love hosting this party! This was the last year for this party to be in our current home and a nice way to say good bye to the old, while keeping my eyes on next years party! Though I know we have to move on, it is really hard to say good bye to our neighborhood, I am struggling a bit with starting over. Next year we shall have even more space so perhaps we will all bake 20 dozen....who is with me? Let me know if I should add you to the exchange! No word of a lie, there is less then a month until Christmas, I swear I just blinked and now I am at least six weeks behind for a holiday that is in 5 weeks, oh and did I mention I am packing for a move as well as hosting a cookie exchange party for 15 tonight? I got in some important reading this week and wanted to share some of my highlights with you. 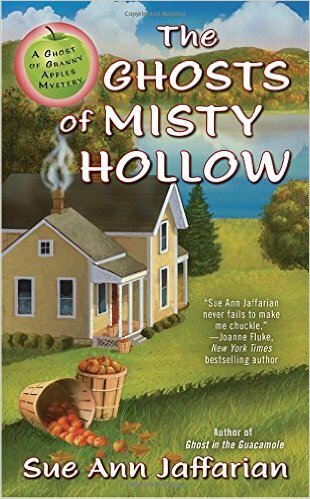 The Ghosts of Misty Hollow is out later this week. This is not a series I had read before and boy am I loving it! I hope to have my review for you Monday! 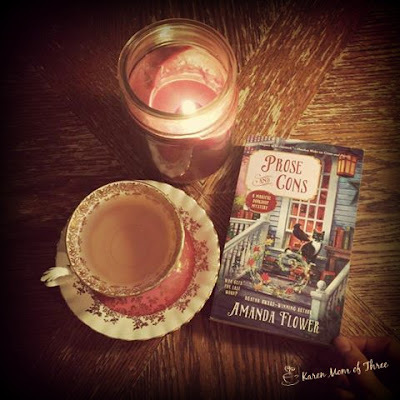 Prose and Cons by Amanda Flower was fantastic, the way a second in series should be and extreamly well written! 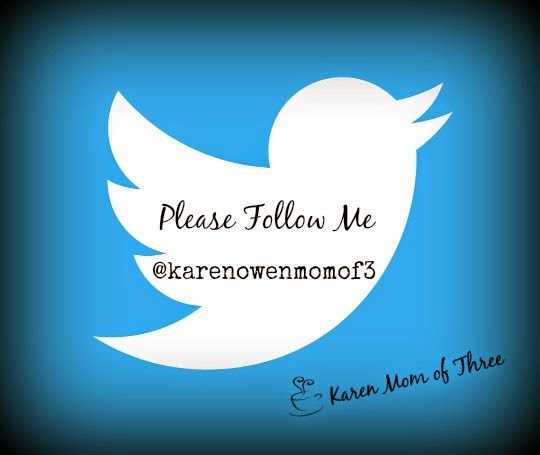 Loved it and hope you will too! 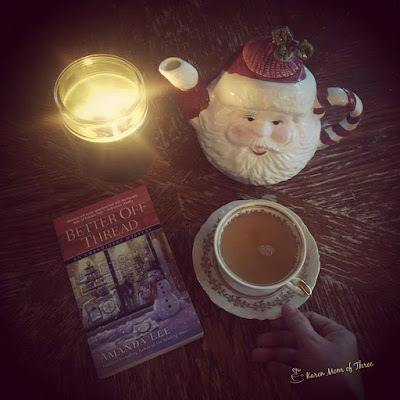 Better Off Thread by Amanda Lee was also a great read, I believe this is book 10 and was a really great mystery! Frosty The Dead Man, the third book in the Snow Glove Shop Mystery series was also a treat to host on my table this week. I put out our well loved and played with Nativity Set last night an well it did not take long for things to get interesting. Here I thought the days of the knock down drag out fights my boys used to have over the baby Jesus would be the only interesting memory I had with this set, nope each year something funny seams to happen when I least expect it, some years our Baby Jesus goes traveling for most of the holiday season, being found on the game pad of the kids video game system, at the bottom of the lego bin or strapped to a Thomas The Tank Engine track....oh boys will be boys. 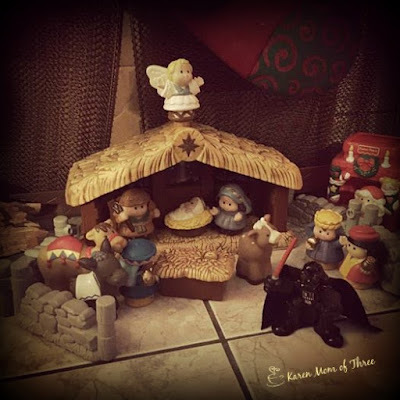 This year the Manger seems to have welcomed Darth Vader....may the Force be with you this holiday season, your cups filled with wonderful Christmas time teas and your reading pile stocked with wonderful cozy mysteries to enjoy! 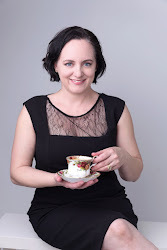 I look forward to sharing more with you tomorrow, thank you for joining me for a cup of tea and a cozy mystery week in review. A Cup of Tea and A Cozy Jewelry and A Tea Pot To Love! It is Black Friday and the deals I hear are crazy everywhere, even here in Canada, it has gained a momentum of Holiday shopping craziness. 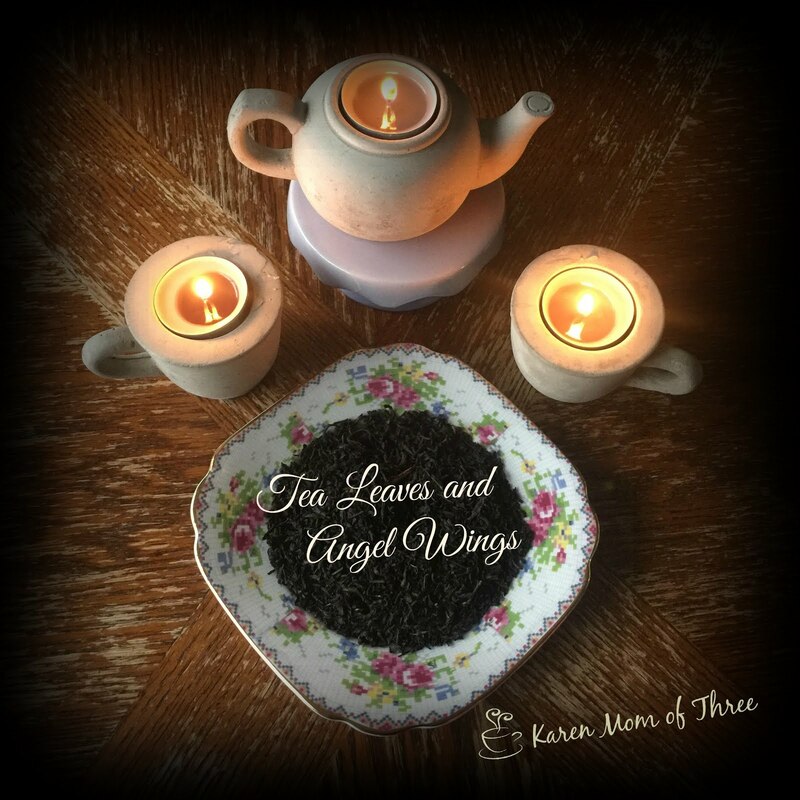 So to save you from running out to the long lines at the mall here are some ideas you may wish to consider for the tea lover in your life. 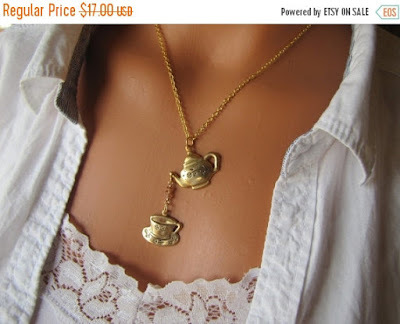 I loved this Necklace from Maple Moon Designs on sale for $14.45 and ships world wide! Click here for shop and listing. 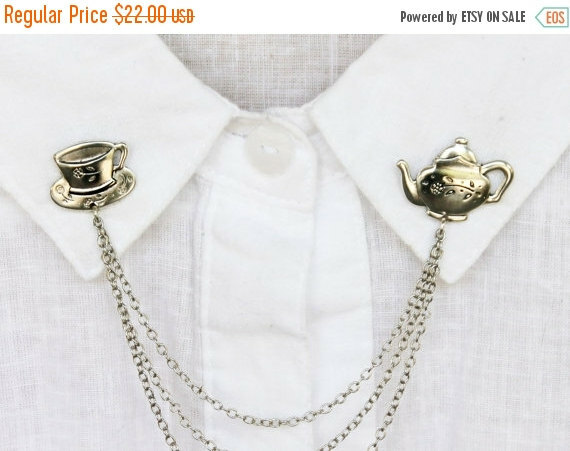 I find this completely adorable, offered by alapopjewelry on sale at $18.70 this is one I think is adorable! Click here for shop and listing. Mann Handled Vintage has a great sale on this beautiful tea pot from the 1940's. I love this listing! Actually the entire shop has fantastic finds and the winking Santa Mugs are awesome! 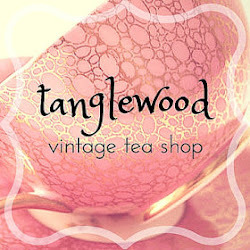 Click here for the shop and listing. 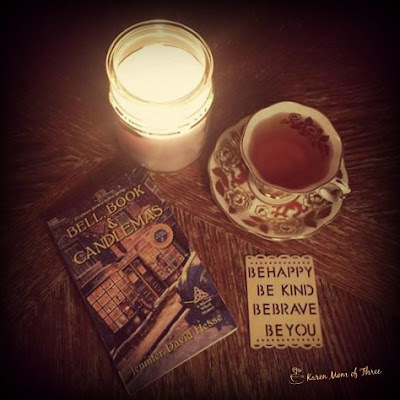 I hope you find yourself warm and cozy today with a great book to read and a great cup of tea! Avoid the lines, do your shopping on line and enjoy all the holidays have to offer. Happy Thanksgiving and One month to Christmas to all, from my table to yours I wish you a safe and happy day. As I am Canadian today is just Thursday here in Canada, though I am creating a Mock Thanksgiving dinner tonight too! 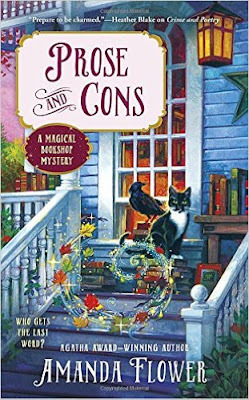 Last night I finished Prose and Cons, the second in the Magical Bookshop Mystery by Amanda Flower. This book was outstanding. I love it when book two is even better then book one and book one was pretty terrific! 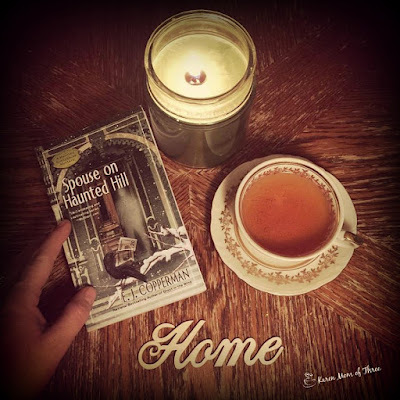 In Prose and Cons I was guessing until the end and really pulling for main character Violet to solve the case, yet found myself running in circles trying to figure out who done it! I was shocked and still am reeling from the outstanding reveal, my lips are sealed though you will have to buy the book! Out December 6th, order now, tuck it in with your Black Friday purchases! You will be glad you did! To order your own copy of Prose and Cons from Amazon please click here. 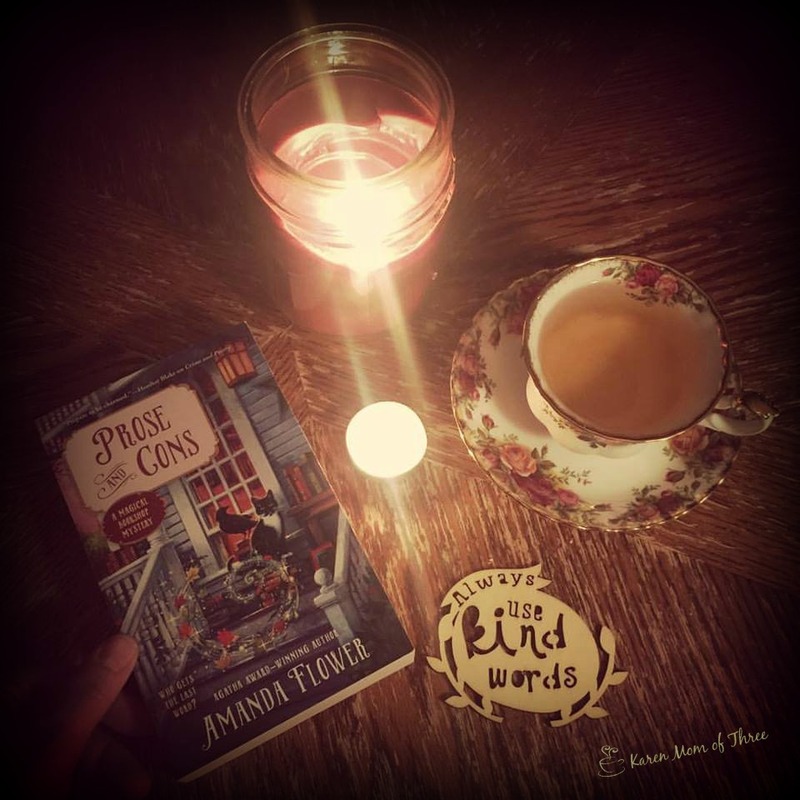 Learn more about Amanda Flower and this series by clicking here. 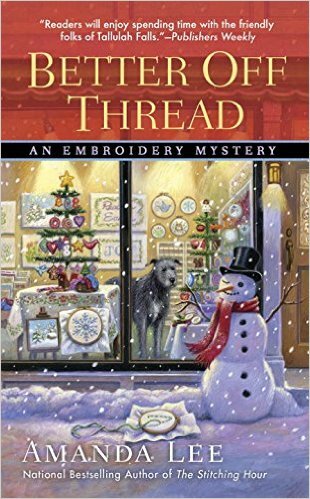 I love reading cozies like Amanda Lee's Embroidery Mystery Series. 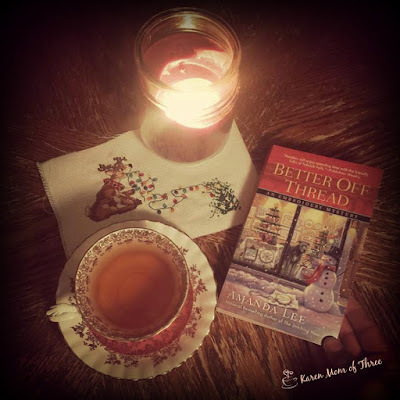 Book 10, Better Off Thread is out December 6th and I loved it. A great pre holiday who-dun-it filled with all the feels! Love her dog so much and I am very sure every time I read one of these books that one day I will have a dog just like Angus! Amanda Lee writes a great character and captures the feel of the small town perfectly in Better Off Thread. This is one to add to your pre Christmas to be read pile for sure! I also love the cover don't you? To order your own copy of Better Off Thread from Amazon please click here. 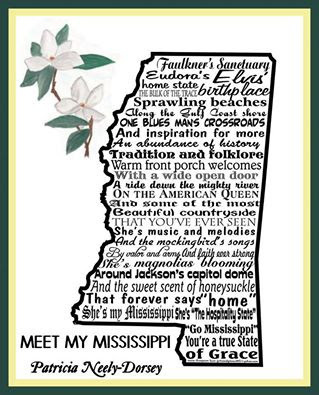 Today I have a special request, a friend of mine Poet Patricia Neely-Dorsey is trying to have her poem Meet My Mississippi become the official state poem. Today I ask that you help her make her dream come true. Reading Patricia's work for the last two years has helped me personally, insipired and changed me in ways only poetry can. 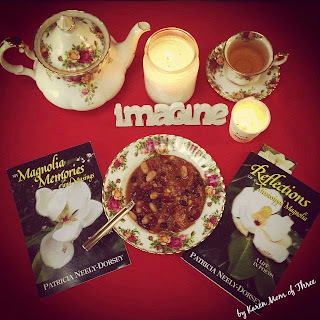 Her two books Reflections of a Mississippi Magnolia and My Magnolia Memories and Musings have been constant treasures on my table for the last few years. Below is the poem Patricia Neely-Dorsey wrote about her love of her state and now you have a chance to help make history! Here is an additional list of members of the Mississippi HOUSE OF REPRESENTATVES with their contact info. Here is a list of members of the Mississippi SENATE with their contact info. Thank you all for your help with this project. 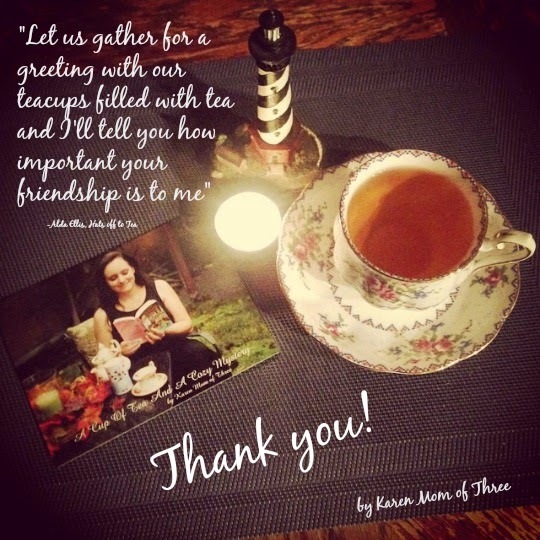 I will be back tomorrow with a cup of tea and a cozy mystery review. 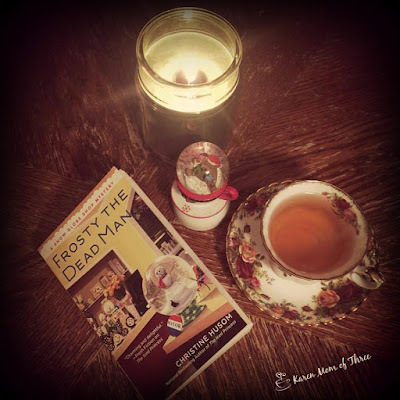 This weekend I read the third book in Christine Husom's Snow Globe Shop Mystery series, Frosty The Dead Man. 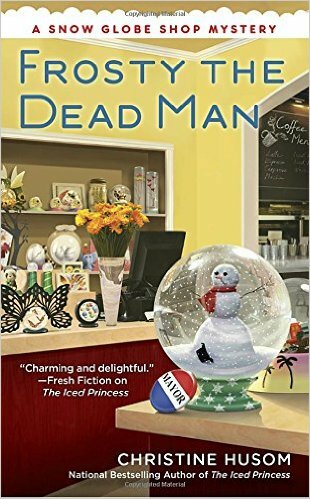 Set in December and smack dab in the middle of the holiday snow globe rush, the local mayor winds up dead shortly after an argument in the coffee shop, Cami finds herself in the thick of it soon after, dealing with stock and inventory woes, mysterious customers, the mayors death and a new employee, not the way Cami had envisioned the holiday season to be. Interesting premise and a cozy mystery for sure, holiday themed and ready to read December 6th. 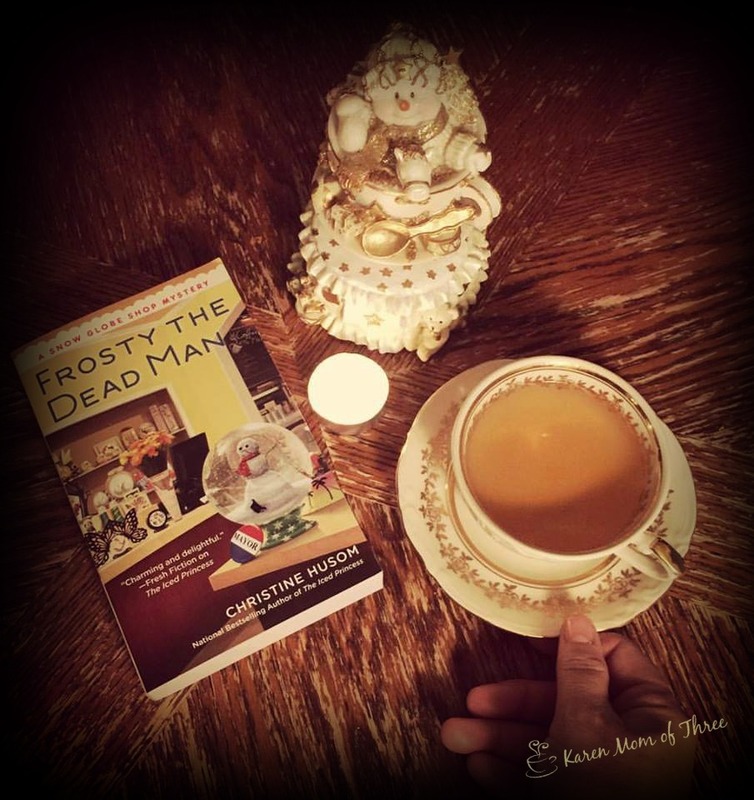 To order your own copy of Frosty The Dead Man by Christine Husom from Amazon please click here. Learn more about Christine Husom by clicking here. This is my front door wreath, a bit bitter sweet as we are moving during the post Christmas rush, however I spent yesterday afternoon with my wonderful friend and Neighbor Jen and her family making wreaths. Last year was the first year I joined their annual get together. I think this is my favorite holiday event! 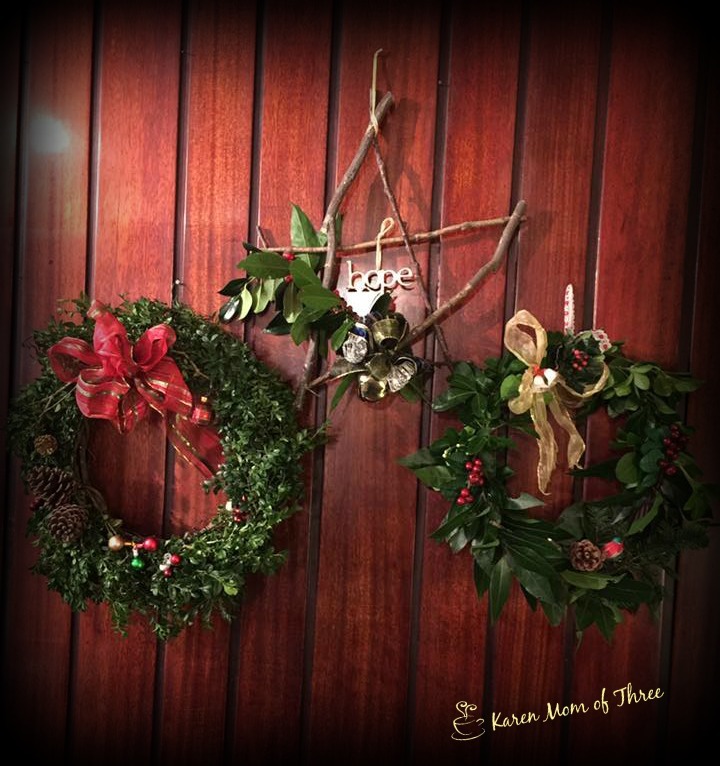 I had never done a fresh wreath for the door and last year I had fun making my star wreaths for myself and a traditional wreath for my mother in law. I was thrilled last year when my stars were so well received. I made several extras this year to bring to the decorating night and everyone who wanted one was able to make one and take it with them. These are some very talented ladies and all the greens came from my friend Jen and her mom's back yards! 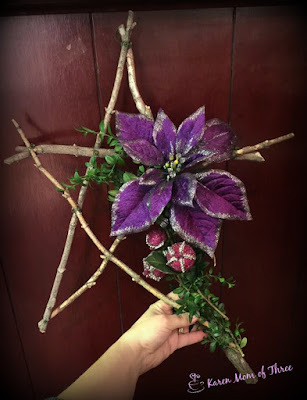 I lost count of how many we made but these are some of my favorites and I hope they inspire you to make things out of items you may just have on hand. This is my second Christmas Star I made in memory of author Joyce Lavene, Purple in her honor, for now I have it hanging in my front entrance but as soon as I get keys to the new place, I plan to go hang it on my new door for the remainder of the holidays. Let me know what you have going on for your front doors this year, I would love to hear it! Next Saturday is our cookie exchange and I can not wait to share photos from that! Saturday morning and time for another week in review. This morning I have Frosty The Dead Man on my table, the third book in the Snow Globe Shop Mystery by Christine Husom. I am looking forward to sharing my review of this December 6th release with you all. 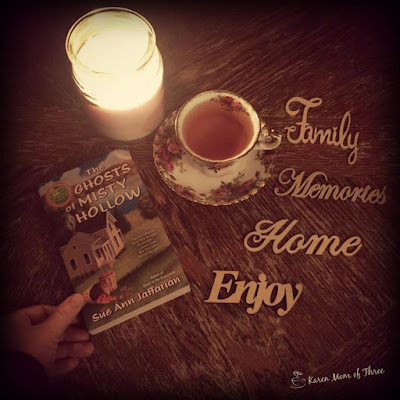 Reading Spouse on Haunted Hill was a lot like going home. This is book eight and was beyond wonderful. 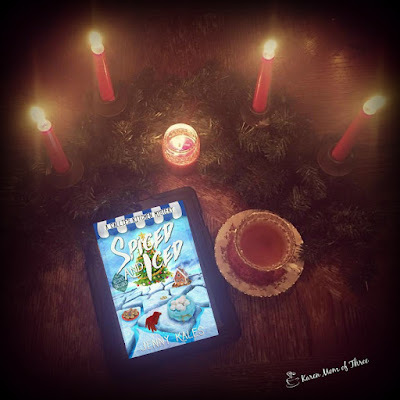 I hung on each word, easily picturing the setting, characters and mystery. Delightful to the end! The end of December has some fantastic books coming out as well. The second book in the Jennifer David Hesse Wiccan Wheel Mystery Series is very exciting. A great mystery and a wonderful book, while the main character is Wiccan this is really not a paranormal cozy, it happens to be a great cozy, fun mystery and a character who just happens to walk the path of a Wiccan Witch. Loved it! Can not wait to read the first one, the second one was so good I must go and buy the first one. 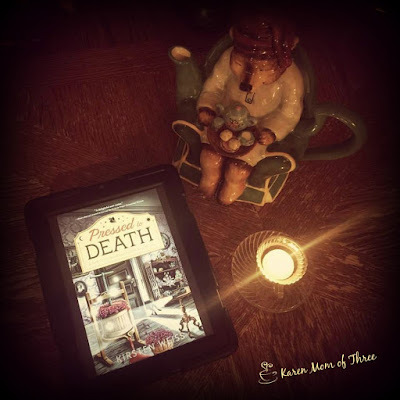 Death Takes Priority, book one in the Postmistress series by Jean Flowers, was another cozy I enjoyed this week, I read and reviewed book two in September and was thrilled to go back and see how it all started. Pressed to Death by Kirsten Weiss actually doesn't come out until next March but I got a sneak peak this past weekend and it was such a treat. Story, subject matter and cover, had me hook, line and sinker! Not a lot new in my cup this week, choosing to stay in my comfort zone with the black vanilla tea from Murchies this week in my cup. 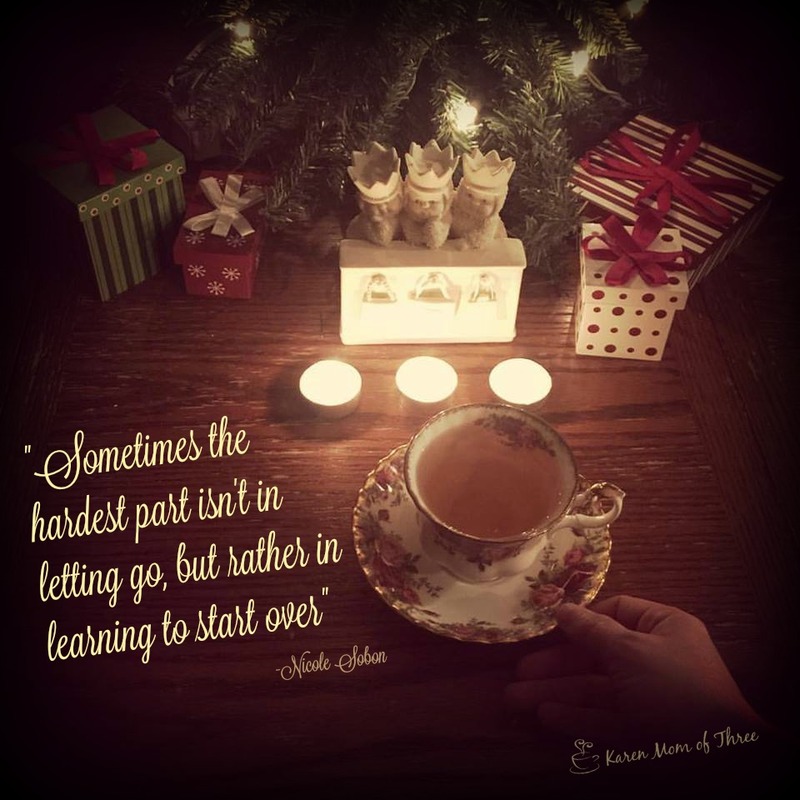 I did sneak a Christmas Eve Tea by Stash in twice, but had them in my mug so not sure that totally counts! 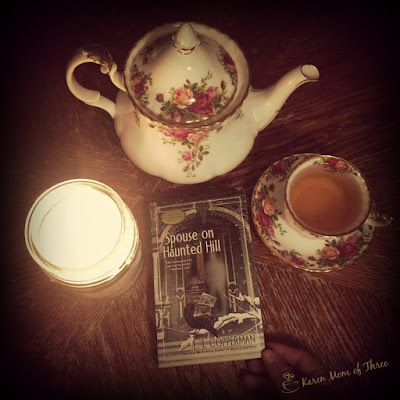 Oh boy are you all going to love Spouse on Haunted Hill by E.J. Copperman. 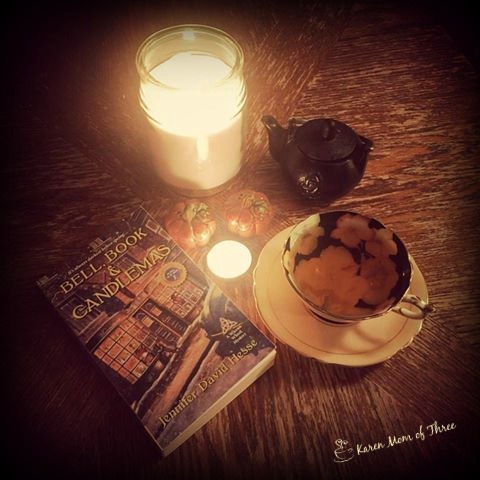 This is the eight book in the A Haunted Guesthouse Mystery series and oh my gosh I could not put it down. Just when I thought things could not get any crazier in Alison's life, this book was so much fun. Crazy, lovely, fun. 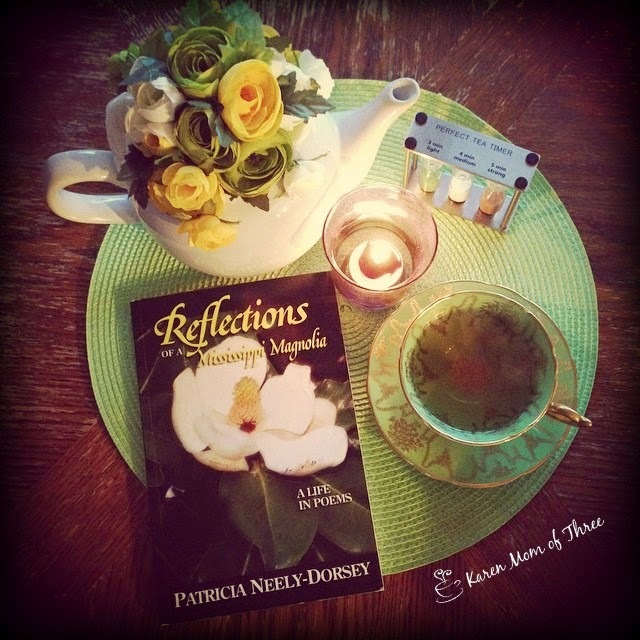 Good mystery, great characters, lovely loose ends and full of great surprises. If you have a cozy mystery lover on your list this holiday season I can recommend these eight books as a great gift! Spouse on Haunted Hill could be a tv movie for sure and this one would be amazing to see on screen. It was so easy to picture each scene, character and setting. I so love this series! I hope you will too! Mark your calender's for December 6th or pre order now! 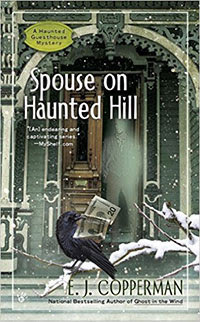 To pre order Spouse on Haunted Hill by E. J. Copperman from Amazon please click here. Learn more about E.J. Cooperman by clicking here. 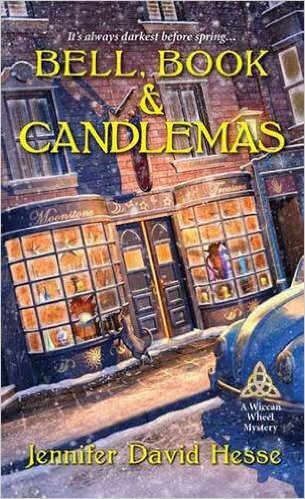 Bell, Book & Candlemas is the second book in the A Wiccan Wheel Mystery Series by Jennifer David Hesse. This book was sent to me to review and what a special treat for me this was. I had not read the first book Midsummer Night's Mischief, but now I really want too! No matter though I had no problems getting into the story and the characters in Bell, Book & Candlemas. This is a great cozy mystery for those of you who like me, who love a good witch mystery. This one I very much enjoyed because while it is a witch mystery it truly is a Wiccan Mystery. 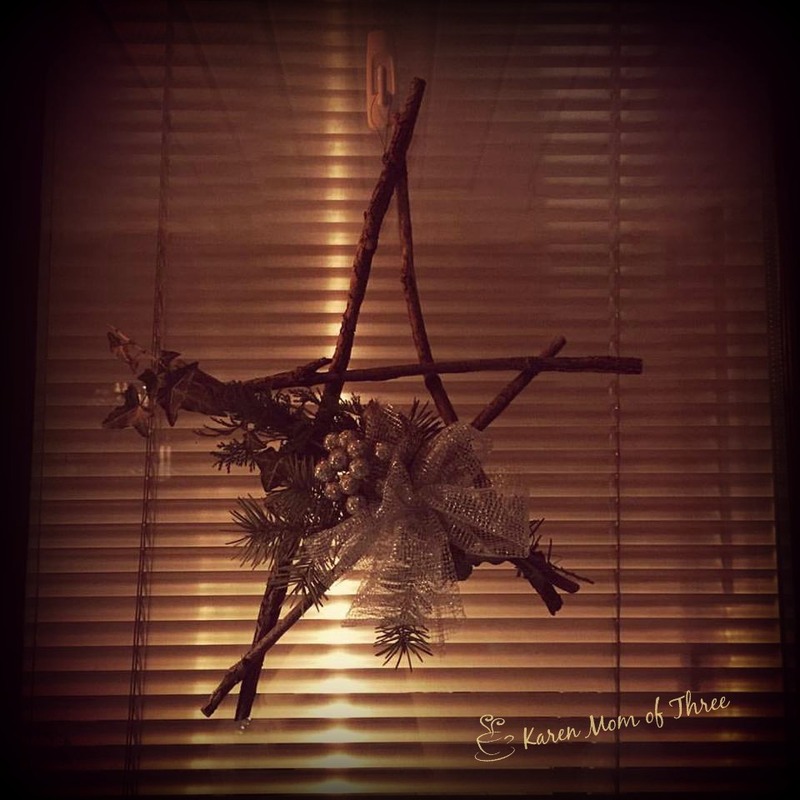 What makes it intriguing to me is that while the main character Keli is Wiccan and considers herself a witch, it is not witch craft that solves the mystery, so this is not really a paranormal cozy, it is really a cozy about a main character who happens to practice the religion of Wicca. Don't question the coziness though this book has that for sure. It is well written and researched and I so enjoyed it. I learned as I enjoyed this book and felt like I wanted to move to Edindale and hang out with Keli, who is a very smart lawyer in addition to being a great armature sleuth. The cover is also truly wonderful and reflective of the story. I could so easily relate to Keli, and her struggle to balance her life, work and religion. How she felt compelled to compartmentalize each thing so that no one would be bias of her religious beliefs. There is an important message and theme in this cozy, about having the courage to be who you are and who you are meant to be. I believe this will be a series I will have to own entirely. I highly recommend it! Be sure to check out Bell Book & Candlemas by Jennifer David Hesse on Amazon by clicking here.